Named after the plaited bread rolls first baked here in The Middle Ages. 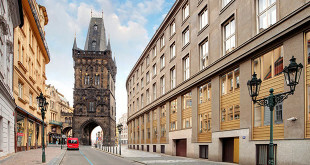 Today Celetna Street is a pedestrian’s lane from the Old Town square to the Powder Tower (part of the Royal Route walk). The Royal Route was a route through the city which Czech kings had to follow on the day of their coronation. 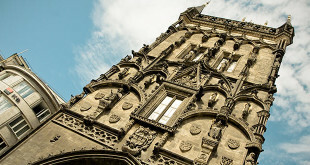 It leads from Vyšehrad – Prague’s second castle – along Celetná Street, over the Old Town Square, along Charles Street and across Charles Bridge up to Prague Castle, where the coronation would take place in the Cathedral of St Vitus. Celetna street is one of the oldest in the city where you can see quite a few architecturally and historically important houses, such as at the Three Kings, at the White Lion, at the Black Sun and at the Vulture. The most interesting one is the Cubist facade on the House of the Black Madonna, which dates from 1912 and houses a branch of the Czech Museum of Fine Arts with a permanent exhibition on Czech Cubism. 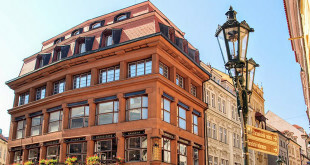 Another interesting building is Mint House which was built in the baroque style in the 18th century, and from the late 18th century housed Prague’s military headquarters. Probably the best preserved historic houses on the street are the parsonage (Celetna 5/601) and the house U Tri Kralu (At the Three Kings; Celetna 3/602). In both, the original Gothic brickwork has been preserved including the 14th-century gables. The latter was once inhabited by the young Franz Kafka. Examples of the earliest, Romanesque, style may be found in the basement of virtually every house on this street. Many of them are currently used as wine bars and restaurants because over the centuries the ground level of the street sunk by several metres. 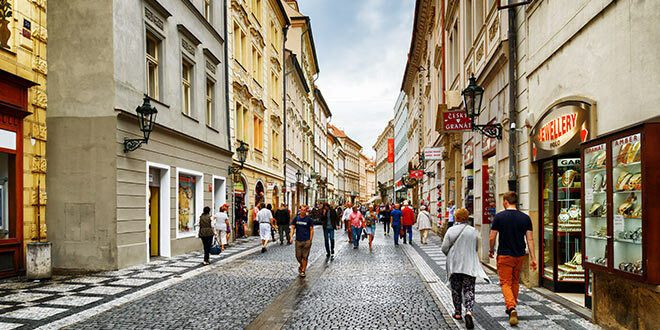 Some of Prague’s famous restaurants are as well situated on the Celetna Street: House At the Golden Vulture, At the Spider and At the Golden Stag. If you like theatre, there is one at Celetna St. no. 17. In terms of shopping, it is here where both smaller and bigger shops started growing, offering with a wide choice of cut and painted glass, crystal, china, jewellery and antiques. One would spend ages here trying to go through all that is offered. It seems almost impossible to house so many international brands within the short street at the Powder Tower. Right next to the monumental tower you will find top brand men’s and women’s fashion as well as brand accessories of the same top quality.